First bake from the new sourdough starter. Made a biga last night using 60g of the discard from stage two in the process. I added just one g of yeast. 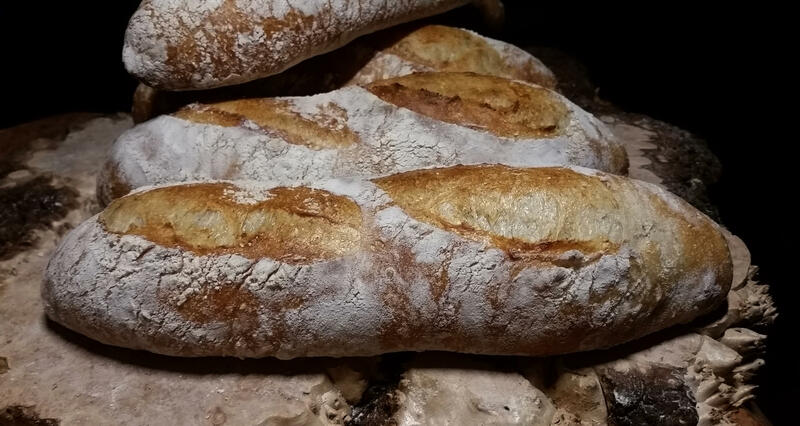 Three batards, one baguette and two small baguette bun size. Really happy with the crumb and shine. Moe had one of the small ones while still warm. With butter. 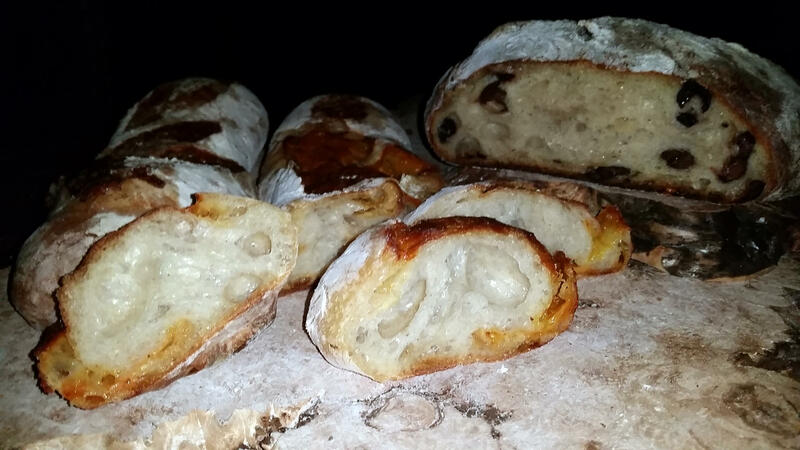 And all but one of the Batards were baked in the CSO. I love that little oven. @Ann_T why rye flour for the starter? @JoNorvelleWalker, I use it because that is what is recommended in Amy Scherber, owner of Amy's Bread in NY. I started this one on Sunday night and was baking with it yesterday. Also, it doesn't break down if you neglect it. It is easy to bring back to life. I've done that a few times. And I know if I let my starter go to long, I can just toss it out and start a new one and have it fully active in a short time. And once it is established you can spin it off into a white starter if that is your preference. 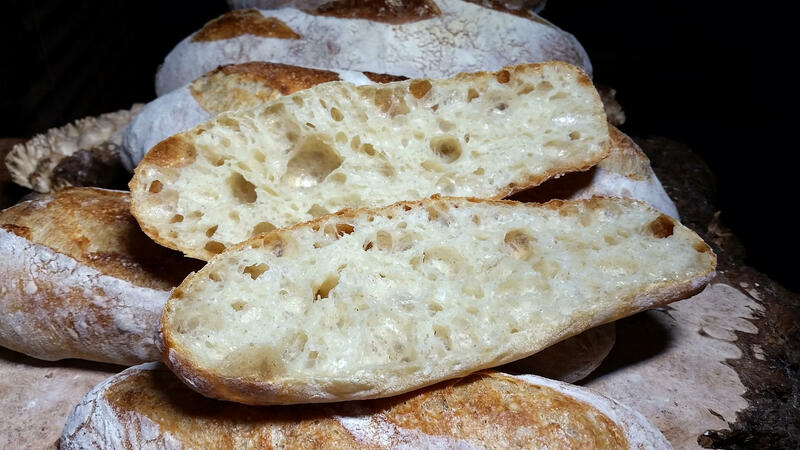 It only takes about 60g or two ounces in a biga or levain to make a 1000 g batch of bread dough. Where some starters call for a cup or more. There is probably some scientific explanations to use rye but I have never had much of an interest in the science of it. 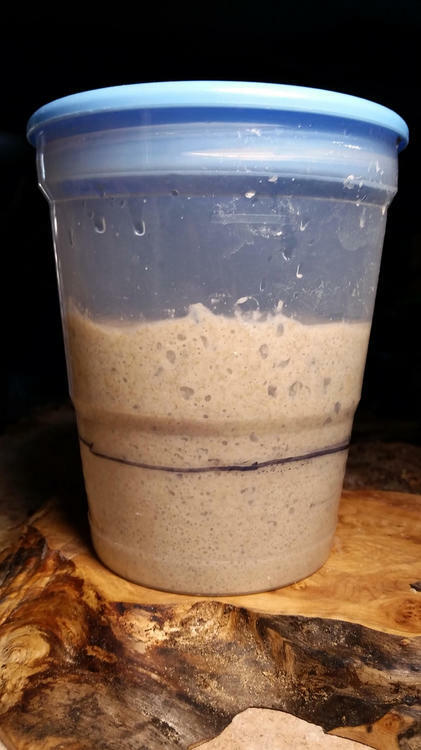 I just like being able to grow a starter and use it to make bread. 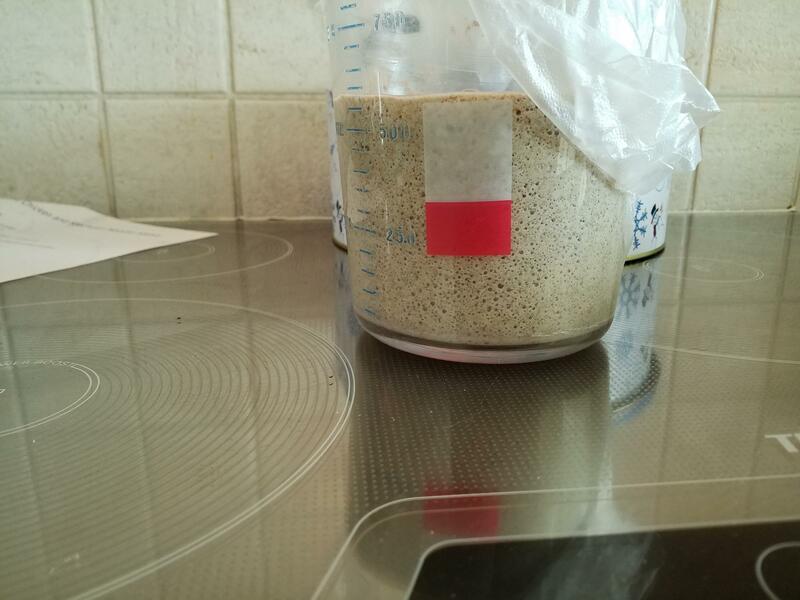 My KAF starter arrived yesterday and I followed their directions to begin; mix starter with ¼ cup warm water, mix, then add 2 cups AP and another 8 oz. warm water. Can I add the rye flour today when I'm going to begin with step 2.
" . Stir the starter and measure out 4 ounces (about 1/2 cup) to feed. The remaining starter (called “discard”) can be thrown away or used in recipes calling for sourdough discard. To the 4 ounces (about 1/2 cup), add 4 ounces (1/2 cup) water and 4 ounces (1 scant cup) flour. Stir well, cover, and let sit until the starter bubbles and increases in volume, about 6 to 8 hours." If so, will there be any benefit or is it irrelevant now? @lindag, I've never purchased a starter, I've always made my own. But I don't see why you couldn't feed your new starter using rye. I'm not sure of the measurements that your starter calls for. I maintain a 12 ounce starter. Feeding is 6 ounces of starter and 3 ounces of rye and 3 ounces of spring water. Never tap water. And I only use about 60g or 2 ounces of starter to make the preferment. And I use the discard for that. 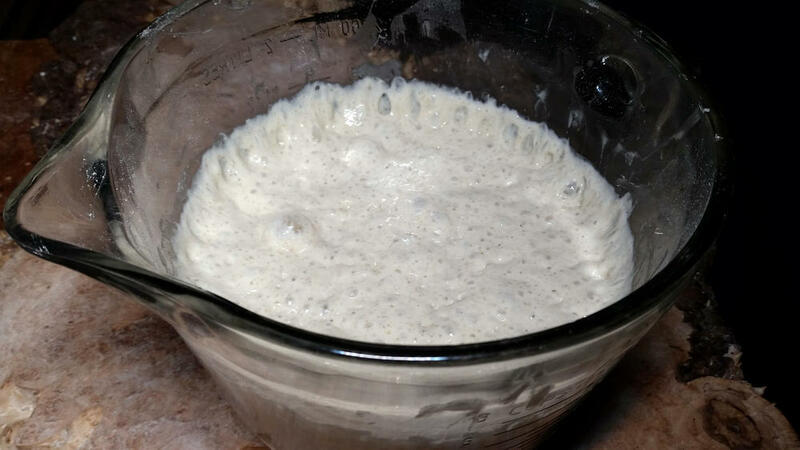 I leave it overnight to rise/develop before adding to a batch of flour. My normal measurements taking into account that the biga has 220g of flour and 220 grams of water, I add another 780g of flour and 530g of water for a 1000g bread dough. 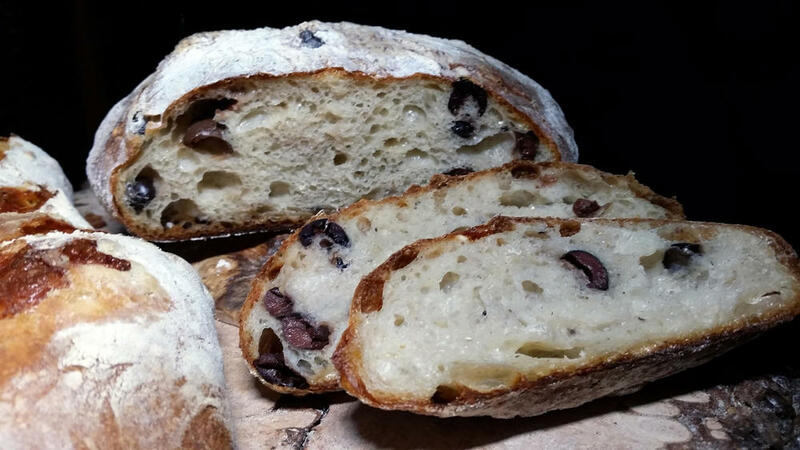 @Ann_T does the rye flour have to be organic? I never use rye flour so having to buy a whole bag would be a waste whereas I can just buy what I need from Bulk Barn. I would assume you are fine with any good quality rye flour. Just buy enough to get the starter going. And once you know it is good, buy more. 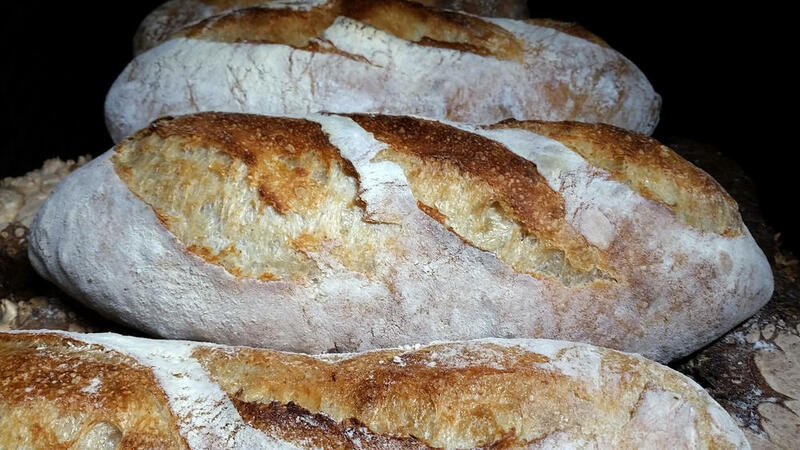 a batch of sourdough rye bread. I posted this same question in the topic The Bread Bible by Rose Levy Beranbaum but I didn't recognize any of the posters names so since my question is about pizza dough, I thought I would ask here, as well. On page 90 she gives a recipe for pizza dough that she says is enough for 2 people. Is it? The recipe calls for 3/4 cup plus 1 tablespoon flour. It seems to me that is not very much. Would strike me it would have to be two people who weren't very hungry. Thanks. That's what I thought. I'll make two batches so that if I need more, it will be there. If there is any left, I'll freeze it. 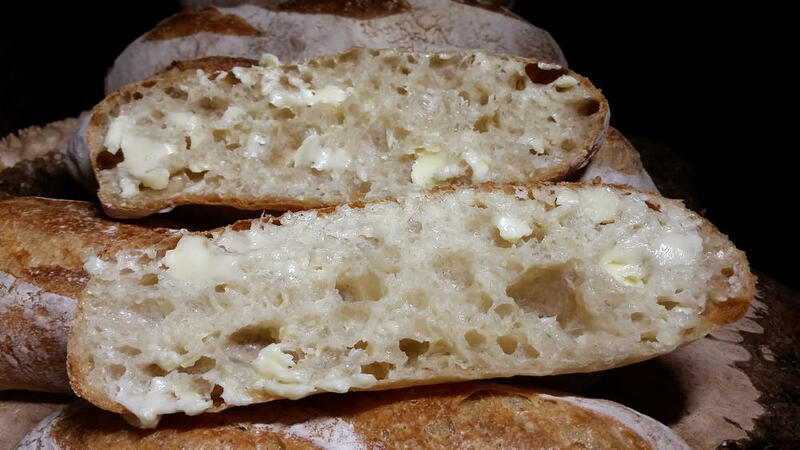 That is a gorgeous crumb! Very much worthy of the long wait. I know that I have mentioned this before. BUT, I LOVE THE CSO. I had an unexpected snow day on Friday. Since I wasn't going into work I decided to bake. I fed the starter and then used the discard in another batch of bread dough. 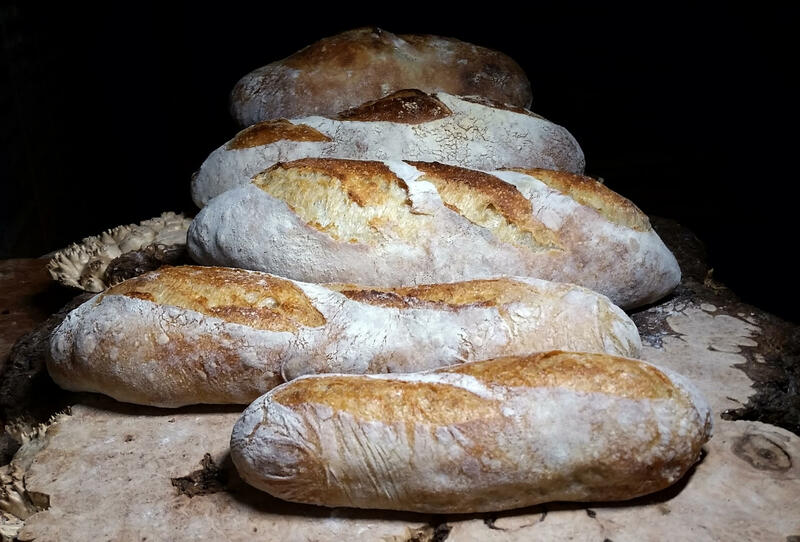 I have been baking one loaf at a time on a stone in the CSO and baking three at a time in the Oster oven. Although the Oster bakes fine, it doesn't steam, and there is a difference in the crust in appearance. The CSO creates a beautiful shine on the crust. And the crust seems to be thinner with a nice crackle. I started each loaf in the CSO on the Bread steam setting. Gave each loaf 12 to 14 minutes before transferring to the stone in the Oster. Another advantage to finishing in the Oster is I'm no longer worried about the top of a loaf burning in the CSO. Usually in the CSO I need to slide a piece of foil over the top of the loaf for the last 5 minutes or so, to prevent the tops from becoming to dark or burning. I'm seriously debating buying a second CSO. Missed a sale Friday at Best Buy. The CSO was on for $199. CAD. I have been bingeing with bread lately. Almost every day I've made a loaf of something or other. I ran across this recipe from King Arthur Flour and can't stop thinking about it. I don't have the rum extract so it will have to wait for a trip to the grocery store but I'll definitely be baking it very soon. Moe would love that bread. 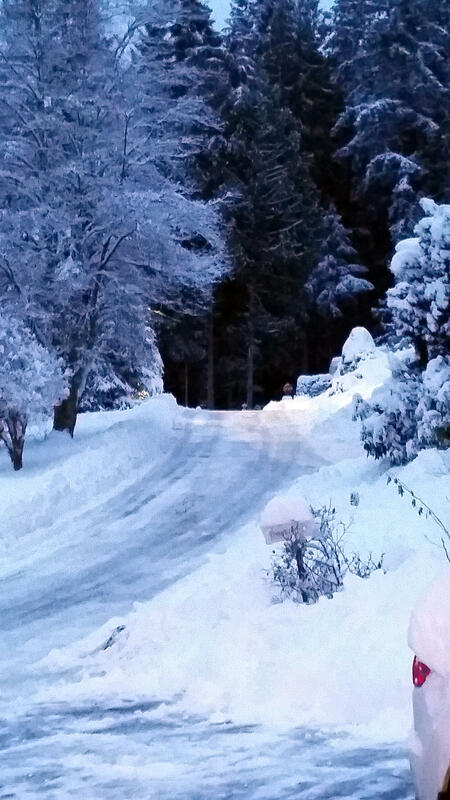 We had a major snow storm here yesterday, somewhere between 12" and 15" , and we are expecting another today. So I'm staying in and having another bake day. and I am planning on making some different loaves today. 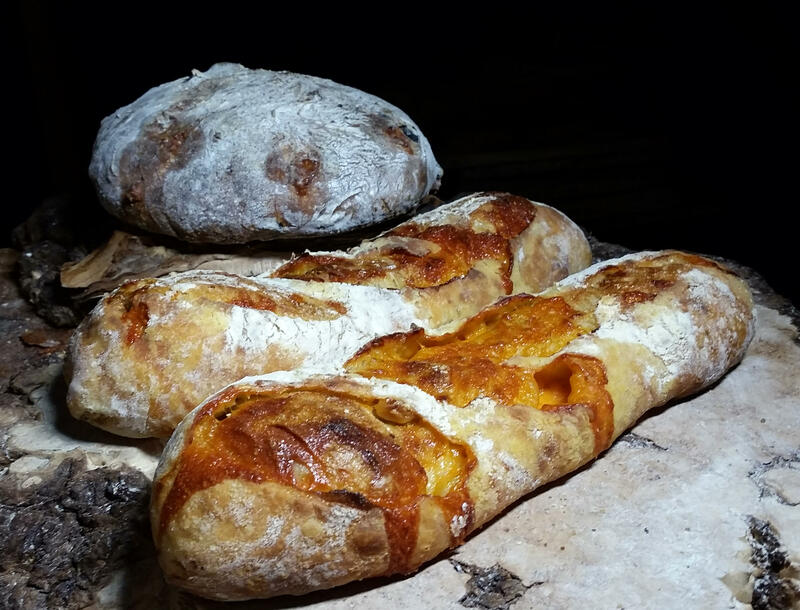 Maybe Kalamata and Parmesan, Roasted Garlic and Cheddar and maybe one more. Haven't decided what yet. @Ann_T I bought organic rye flour (cost was 45 cents!) And started the starter. Phase 2 is happening now and it has already doubled after only 3 hours. I'm so glad you posted about this. On the bottom of the instructions, you have added a note. Are you able to tell me about how much water to add and how many loaves this makes? @ElsieD, Do you mean when you are ready to start a dough using the starter? 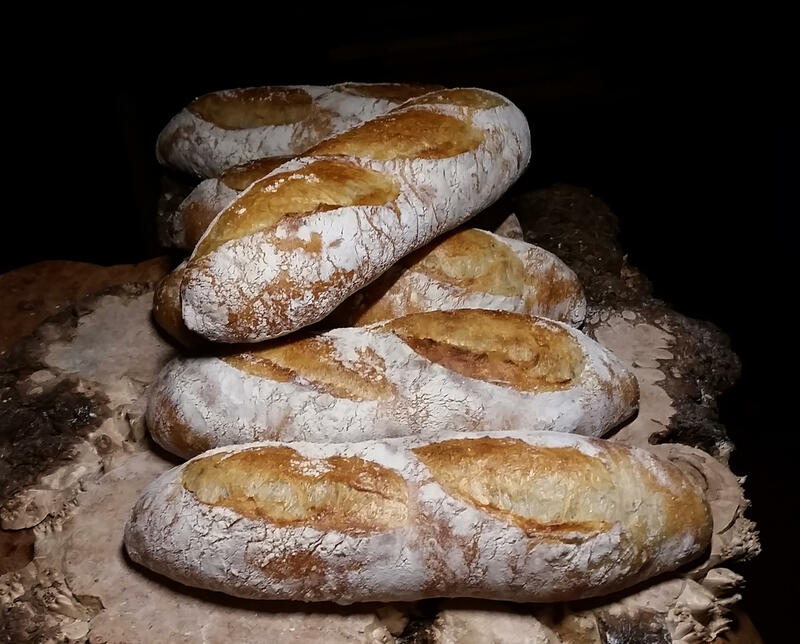 Do you plan to start with a biga? The biga instructions are clear and I have made and used biga before. It is where the note says to add 4 cups of flour and enough water.......it is that water I am wondering about. I realize the amount can vary depending on humidity levels but I am wondering what to use as a starting point. @ElsieD, that must be one of the older posts, before I switched to the metric scale and to the stretch and fold method. Here is the formula that I have used for the last 5 years. The biga is 220g of flour and 220g of water. So for a 1000g batch of dough you want to add the biga to 780g of flour to equal 1000g (780 + 220) and 530g of water for 75% hydration. (530 + 220) If you want a lower or higher hydration just adjust. I never adjust for humidity when using the scale. It is more accurate regardless of the flour you are using. Thank you. I have updated my info. Here is a picture of what I have. The bottom of the red stick-on shows the level it was at this AM after I added flour and water. That was 36 hours or so after I first mixed it. I think it's coming along nicely. Next time I will add bread flour and slowly change it to a white starter. Successfully, I hope. @ElsieD It is looking good and strong. Looking forward to your first bake. @Ann_T I have one more question, if you don't mind. Tonight I will be adding the 3 ounces each of water and flour as called for in phase 3. My question is, when can I start using it? Thank you again. You have been very helpful. So you are starting Stage Three which is the maintenance stage. From now on when you feed it, you will measure out 6 ounces of starter and feed it with three ounces of water and three ounces of flour. Once it has doubled it can go into the fridge or you can feed it again using the same formula but use the discard in a biga. . I make the biga at night and leave it on the counter to rise, and then add it to a batch of dough in the morning. 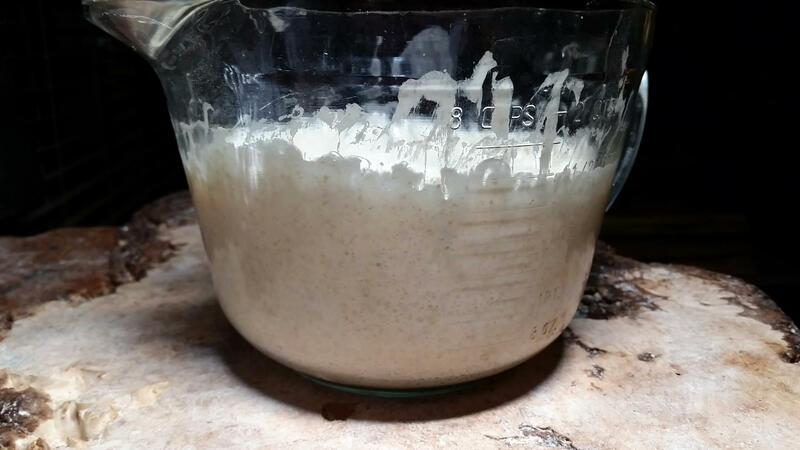 What I would do tonight though is instead of tossing the discard , I would add it to a biga and when you make bread with it, I would also add just one gram of yeast for insurance. That is what I did when I was feeding Stage three. The power went off just as I was going to take a picture of the sliced Roasted Garlic and Cheese, so I had to use the flash light on my phone. 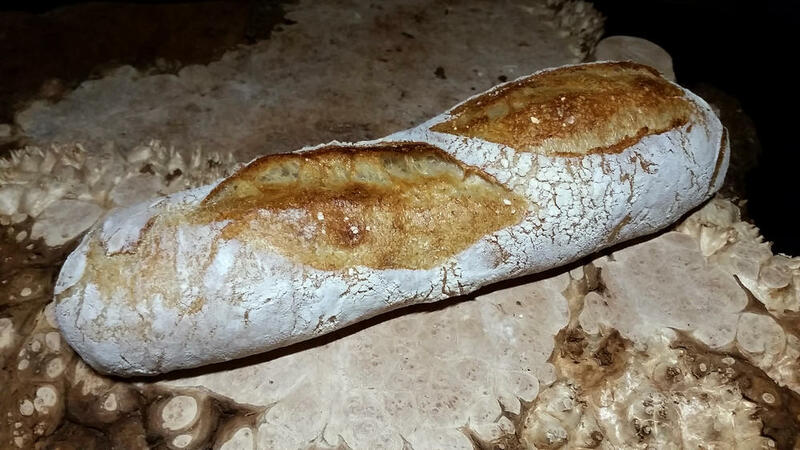 Thankfully it wasn't off long because I still had two baguettes proofing. In the oven now. Fingers crossed that the power stays on.